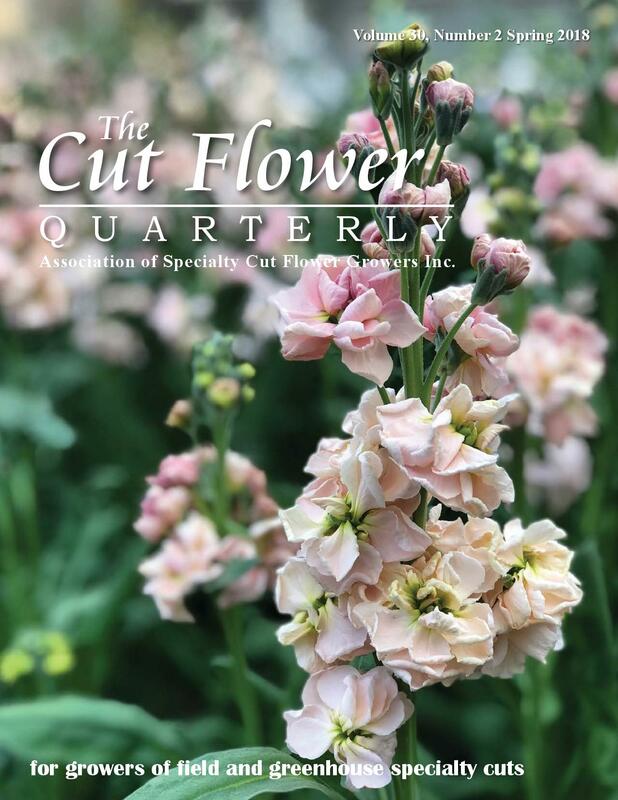 Note: This article appears in the Spring 2018 issue of Cut Flower Quarterly, the publication of Association of Specialty Cut Flower Growers. There is a sweet spot in our industry when flower farmers make personal connections with floral designers and I’ve heard time and again how rewarding it is for flower farmers to see their fresh, local and seasonal botanicals elevated as floral art by talented designers. It is these types of face-to-face connections between grower and florist that has propelled local flowers to be “the most exciting story in the floral industry today,” as one leading floral educator recently told me. 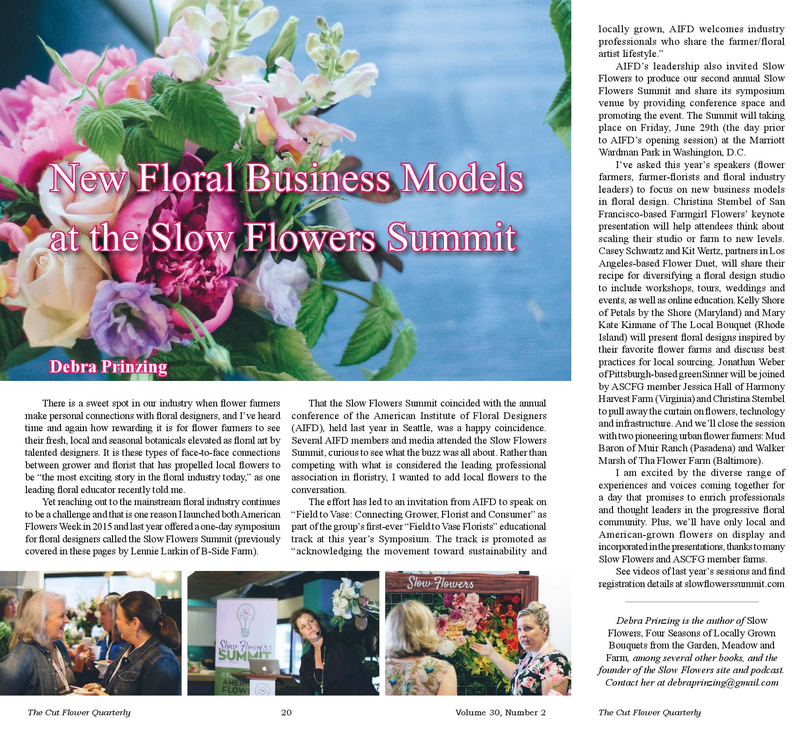 Yet reaching out to the mainstream floral industry continues to be a challenge and that is one reason I launched both American Flowers Week in 2015 and last year offered a one-day symposium for floral designers called the Slow Flowers Summit. That the Slow Flowers Summit coincided with the annual conference of the American Institute of Floral Designers (AIFD), held last year in Seattle, was a happy coincidence. Several AIFD members and media attended the Slow Flowers Summit, curious to see what the buzz was all about. Rather than competing with what is considered the leading professional association in floristry, I wanted to add local flowers to the conversation. AIFD’s leadership also invited Slow Flowers to produce our second annual Slow Flowers Summit and share its symposium venue by providing conference space and promoting the event. The Summit will taking place on Friday, June 29th (the day prior to AIFD’s opening session) at the Marriott Wardman Park in Washington, D.C.
I’ve asked this year’s speakers (flower farmers, farmer-florists and floral industry leaders) to focus on new business models in floral design. Christina Stembel of San Francisco-based Farmgirl Flowers’ keynote presentation will help attendees think about scaling their studio or farm to new levels. Casey Schwartz and Kit Wertz, partners in Los Angeles-based Flower Duet, will share their recipe for diversifying a floral design studio to include workshops, tours, weddings and events, as well as online education. Kelly Shore of Petals by the Shore (Maryland) and Mary Kate Kinnane of The Local Bouquet (Rhode Island) will present floral designs inspired by their favorite flower farms and discuss best practices for local sourcing. Jonathan Weber of Pittsburgh-based greenSinner will be joined by ASCFG member Jessica Hall of Harmony Harvest Farm (Virginia) and Christina Stembel to pull away the curtain on flowers, technology and infrastructure. And we’ll close the session with two pioneering urban flower farmers: Mud Baron of Muir Ranch (Pasadena) and Walker Marsh of Tha Flower Farm (Baltimore). I am excited by the diverse range of experiences and voices coming together for a day that promises to enrich professionals and thought leaders in the progressive floral community. Plus, we’ll have only local and American grown flowers on display and incorporated in the presentations, thanks to many Slow Flowers and ASCFG member farms. See videos of last year’s sessions and find registration details at slowflowerssummit.com.